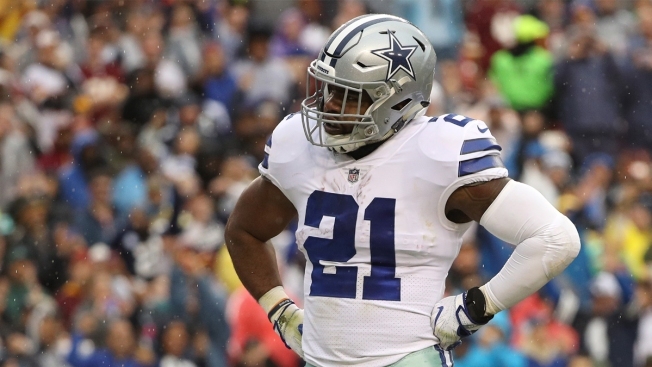 Dallas Cowboys running back Ezekiel Elliott has no chance with his latest attempt to delay a six-game suspension for alleged domestic violence, NFL lawyers said Thursday. The attorneys told the 2nd U.S. Circuit Court of Appeals in Manhattan that it should not interfere with Elliott beginning his suspension Sunday when the Cowboys play Kansas City at home because the NFL Players Association "has no likelihood of success on appeal." The union has asked the court to block the start of the suspension until it considers its request to overturn a lower-court ruling on the grounds that Elliott's career will be irreparably harmed if his suspension begins now. The league said in a written submission that the public, including NFL fans and victims of abuse, have a "strong interest" in seeing that penalties stemming from domestic abuse by NFL players are promptly investigated and that discipline is imposed in a timely manner. It said "swift discipline" should not be manipulated by players and teams seeking to strategically time court challenges so that suspensions are served when they play weaker opponents or when an injury would already require a player to remain off the field. U.S. District Judge Katherine Polk Failla ruled Monday that the 22-year-old athlete must begin the suspension that was imposed in August after the league investigated several alleged physical confrontations in the summer of 2016 with his then-girlfriend. The union said Failla erred by ruling that the NFL's claims were supported by federal labor law because the league followed the collective bargaining agreement in suspending Elliott. Lawyers for the players association said Failla was the first judge ever to have "concluded that professional athletes with short career spans do not face irreparable harm" when suspensions are enforced before appeals options have been exhausted. The NFL said roughly 100 players have been suspended for approximately 500 games over the past season and a half. "Elliott's claim of irreparable injury is indistinguishable from those that could be made by 100 other players," the league said. If Failla's ruling is not blocked, Elliott will not be eligible to return until the team's final three games, starting Dec. 17 at Oakland. The Cowboys (4-3), defending NFC East champions, are in second place in the division. Earlier in October, a federal appeals court threw out a Texas court's injunction and ordered the dismissal of Elliott's lawsuit there.